How Do I Use Advanced Find and Replace? Finding that one, specific keyword in your entire file can be difficult, especially if you then need to locate all instances of the word and change it to something else. Fortunately, many text editors come with advanced Find and Replace functions that allow you to search for whatever you need and then replace it with another phrase. Even the most basic text editors, like the default Windows Notepad, come with Find and Replace, although these functions are much less customizable and powerful than those in more advanced text editors. Notepad's Find function sometimes fails to recognize elements such as case, which can cause missing or misleading Find results. For the majority of Windows programs, the Find shortcut keys are Ctrl+F, while the Replace keys are Ctrl+H. You can also locate the Find and Replace options through the menu toolbar of most text editors. 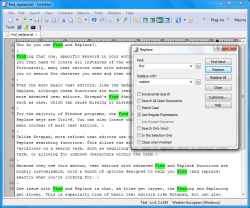 Unlike Notepad, more refined text editors use regular expressions to power their Find and Replace searching functions. This allows the software to search for complicated variations on a search term, such as requiring the term to appear after a certain other term, or allowing for unknown characters within the term. Because they use this method, text editors with advanced Find and Replace functions are highly customizable, with a bunch of options designed to help you find (and replace) exactly what you're looking for. One issue with Find and Replace is that, as files get larger, the Finding and Replacing get slower. This is especially true of basic text editors like Notepad, but can also become an issue for more advanced text editors. Some programs combat this issue with an overall lightweight design and minimal memory usage. Other Find and Replace features, like multiline Find/Replace and case matching, may be important or not depending on what you use your text editor for. Learning how to use the options in Find and Replace to suit your needs can open up a whole new world of searching possibilities.